Hey Everyone!! 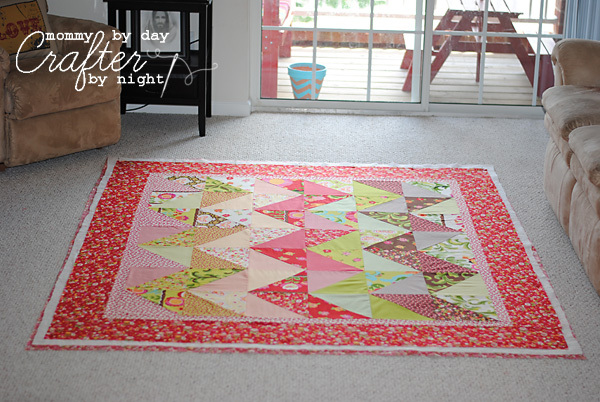 How did quilting your quilt go last week? Is everyone ready for the final step!?! Today we are going to bind our quilt! 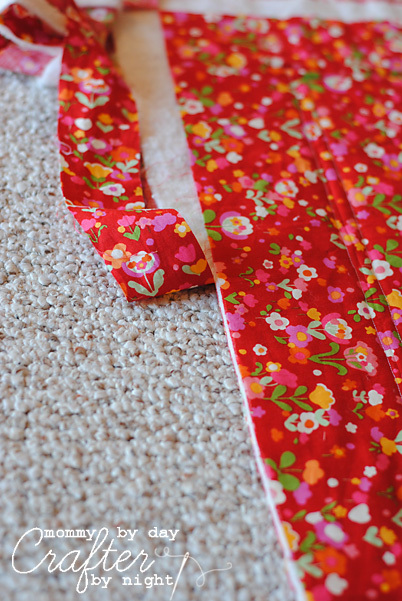 Step 1: First you are going to trim off your excess batting and backing fabric. (For this step I just use fabric scissors and cut as straight as I can) At this point you can check to see how "square" your quilt is. If you are off by just a bit, I wouldn't worry about it too much... 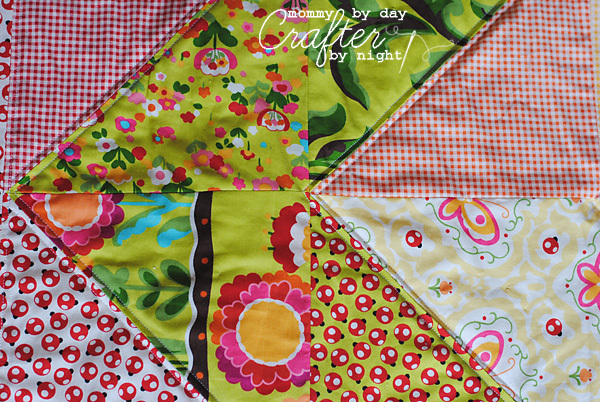 If your quilt is noticeably un-square you may want to take a straight edge ruler and trim off a bit here and there to make your quilt square. Step 2: Lay your quilt aside for a minute and we are going to make the binding. 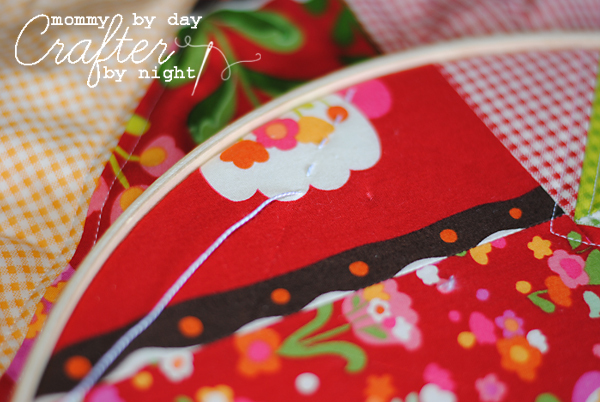 Take out your 7 strips of fabric for the binding that you cut back at the beginning of the quilt along. 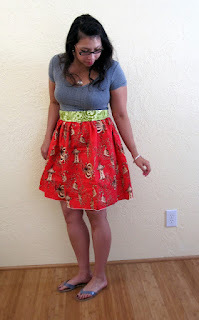 You should have 7 strips of fabric that are 2 1/2 by 44 inches. You are going to put each of the strips right side together (2 at a time) and piece them until your strips are one long strip measuring approx. 2 1/2 x 308 inches. Once your long string of fabric is pieced, take it over to the ironing board and press open all of the seams that you just sewed together. 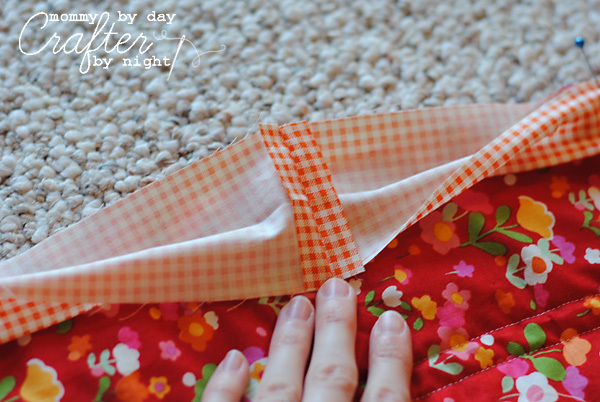 Next fold your fabric in half wrong sides together and press. 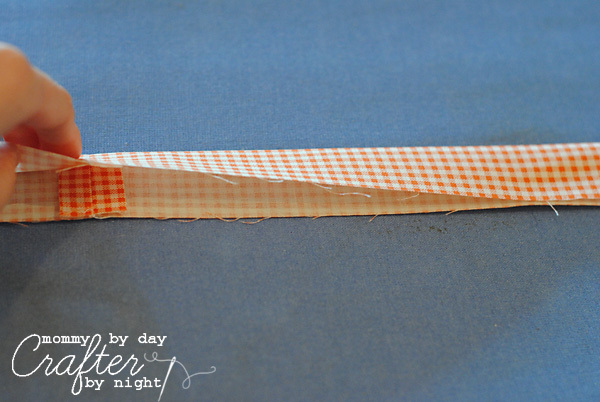 When you are all done, you should have a long strip of homemade biased tape ready to add to your quilt's edge. Ok... there are many ways to sew on your quilt binding. I always use this method- that I learned on Diary of a Quilter- that involves sewing your binding to the front side of your quilt with your machine and then hand stitching it to the back side, but with this quilt I decided to try out the "easy" method by sewing the binding to the back side of the quilt and then folding it over and sewing it to the front side with my machine. No hand stitching involved with this method. So it is totally up to you and what you want to do. 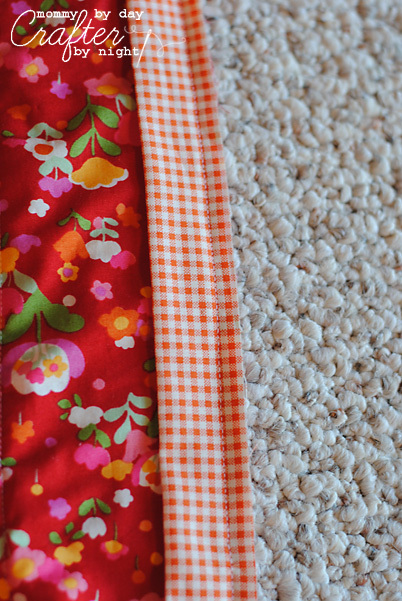 The method I am teaching on my blog takes probably an 1/8 of the time the long method takes, but in my honest opinion- I think the long method with hand stitching looks a lot nicer. 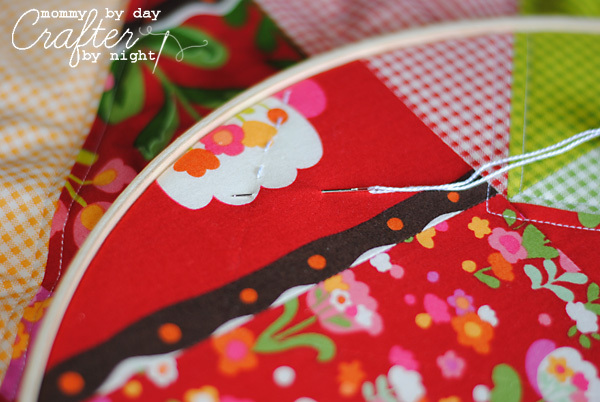 So if you would like to do the hand sewing method- refer to this awesome tutorial by Amy. If you are short on time and wanna finish this puppy quicker, use this method. Step 3: Lay your quilt out flat on the ground so that the back of the quilt is facing up (the zig zag part should be facing down). 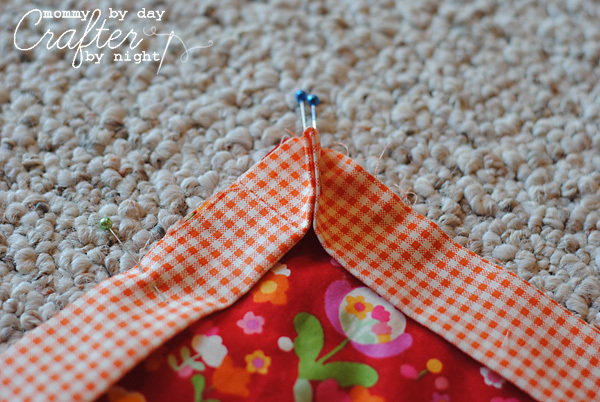 Use your straight pins and pin the quilt binding all the way around the edge of the quilt. 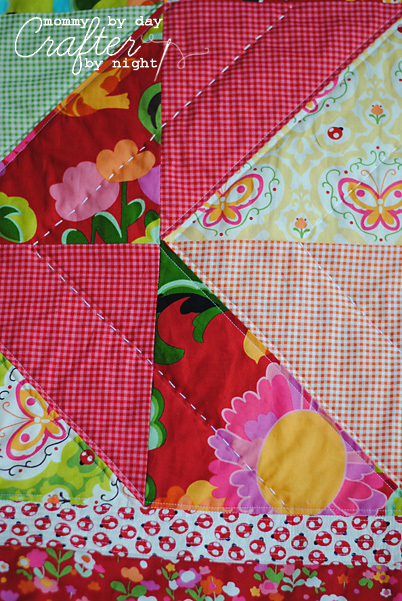 The raw edges of the binding should be facing towards of the outside of the quilt or lining up with the raw edge of the quilt. Step 4: When you get all the way around the quilt, you are going to open the binding and sew it to the other piece that has wrapped all the way around the quilt to meet back up. 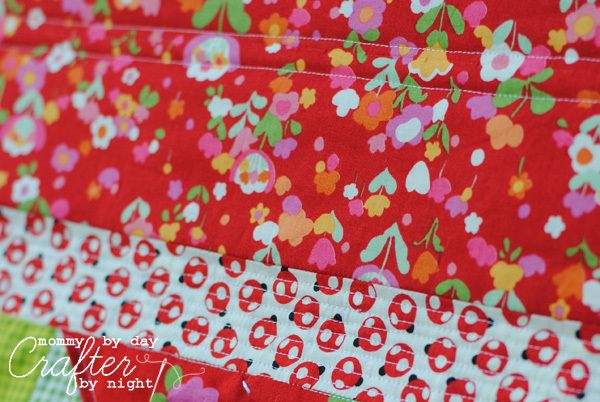 (make sure that you sew it exactly where the binding meets so that once it is trimmed, it lays totally flat) Once it is sewn, trim off the excess, and then pin that portion of the binding to the quilt. It will look like this when the binding is all folded back up. Step 6: Once your binding is all sewn to the back or your quilt, you are going to fold it over to the front of the quilt and pin it all the way around. When you get to a corner, fold it like this. 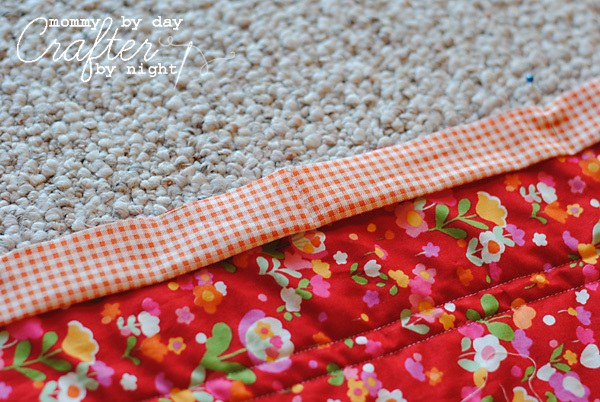 Step 7: Now you are just going to sew the binding to the front of the quilt, taking the pins out as you go. Sew as close to the edge of the binding as you can and keep it consistent throughout sewing the binding on so that it looks nice and neat. That is is- YOU ARE FINISHED! Take a deep sign of relief! 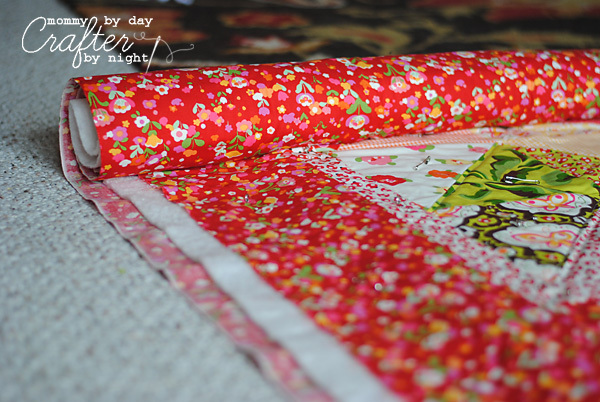 I like to wash my quilts right when I finish them- just to give them that crinkly goodness that quilts are famous for. 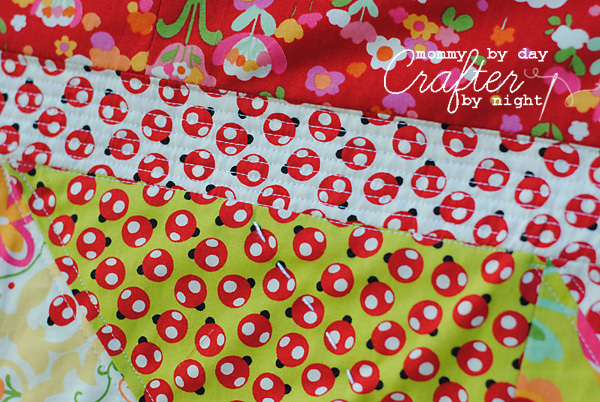 I always throw a shout color catcher in with my quilt to catch any bleeding colors (especially if red is in the mix of fabrics). I use a teeny tiny bit of detergent and wash mine on the cold water setting. Then I throw it in the dryer and when it's all done- your quilt is all crinkled and soft and ready to be snuggled with! And as always- I need to thank my "quilt model" for holding up the quilt for pictures... This time it was my hubby- Jeff! 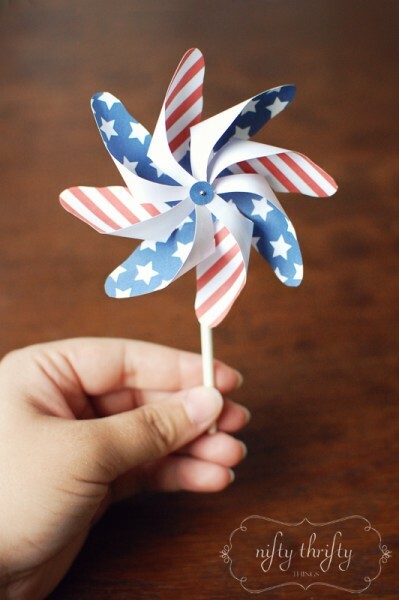 We had a lot of fun fighting the wind while our neighbors looked out and thought we were crazy running around the yard with a flapping quilt in the breeze! ha ha Love ya babe! 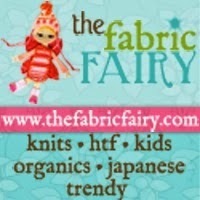 And a VERY VERY big thanks to our sponsor of this quilt along... THE RIBBON RETREAT!! Love this shop! Make sure to give them some love! 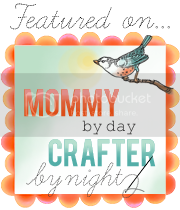 Remember that all Mommy by day Crafter by night readers get 10% off on all orders... use the code Mommy10 at checkout! 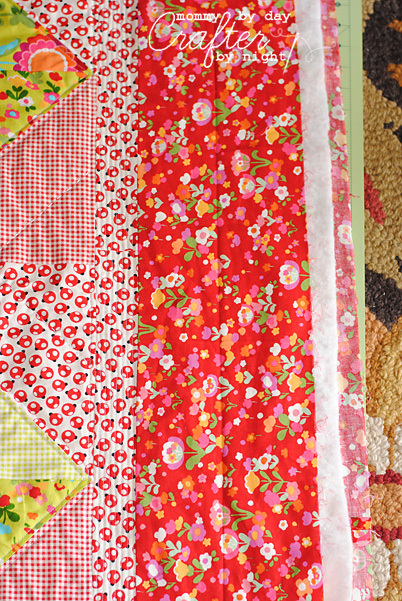 I think the thing that I have been most excited about with this quilt along- is seeing how your quilts all turn out! 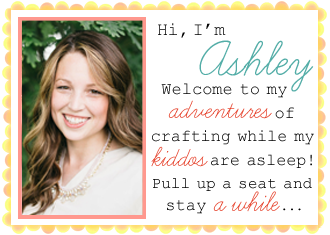 So Rach and I thought it would be fun to do a link party and let everyone link up their quilts for all to see! 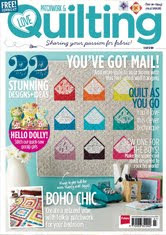 So... drumroll please... here are your quilts!!!! 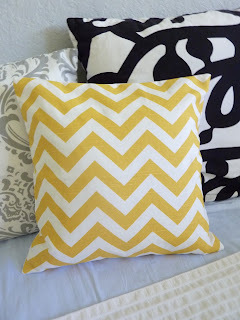 Both the Zig Zag and Ruffle Quilts. 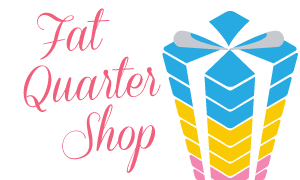 Be sure to stop by Family Ever After to enter the quilt along giveaway to win an awesome fat quarter bundle from Riley Blake!! Like I have said all throughout this quilt-a-long... I am not an expert! 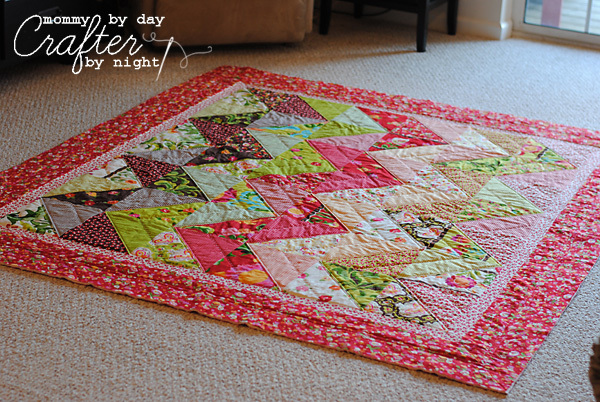 So the way I quilted my quilt is just one of many options you have when quilting YOUR quilt. So keep this in mind. If this part of the quilt along freaks you out- there are totally places that will do this step for you. 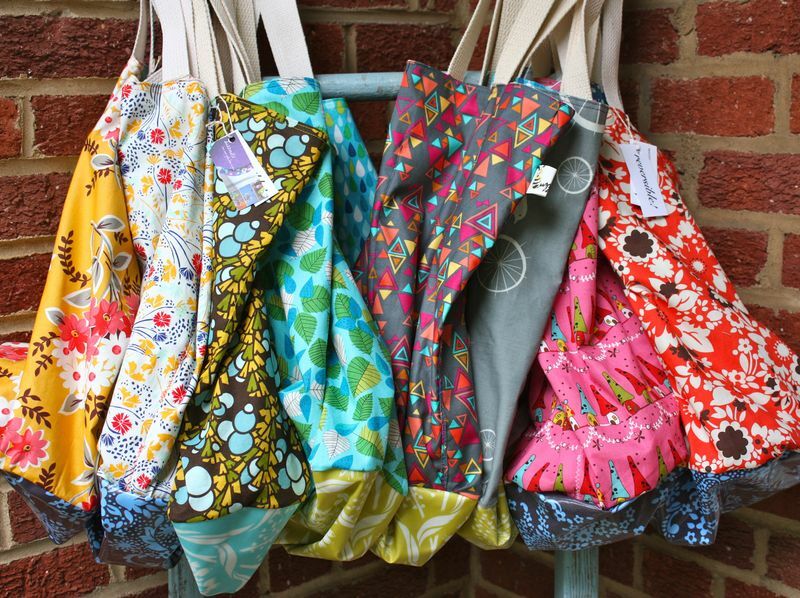 It just costs money, and due to how fabric is, I have always just done this part myself to save on the overall cost of my quilts. 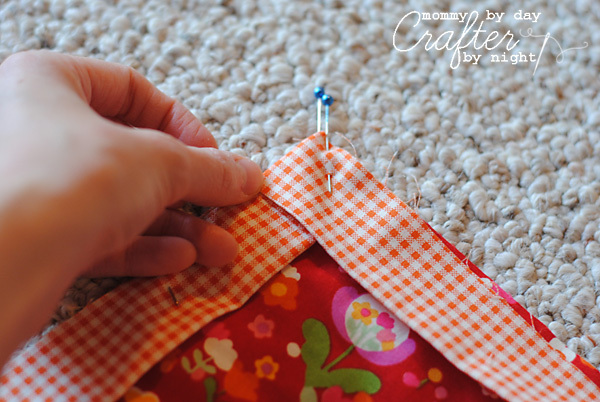 Step 1:Lay your two strips of fabric right sides together (make sure that the grain/pattern of the fabric is going in the correct directions) pin and sew. Press open the seams and iron all the wrinkles out of the fabric. Lay flat on the ground wrong side facing up. 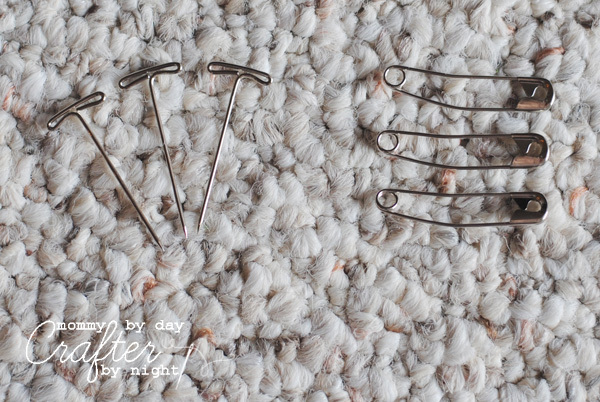 Now for this next part- these two types of pins are a life saver for me. The ones on the left are called T-Pins and the ones on the right are curved safety pins. Here is what I use them for. 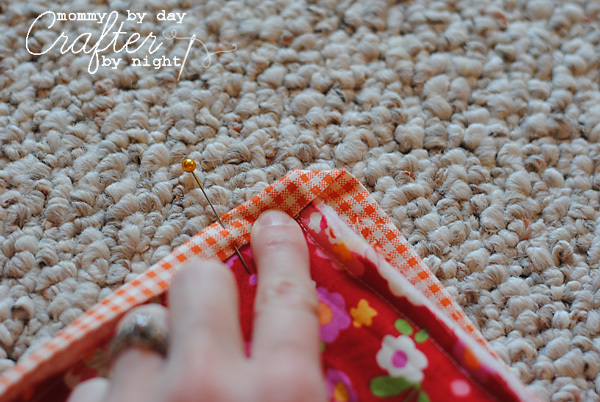 Once I lay my quilt backing out on the floor, I smooth it all out and then I use the t-pins and I put them at all four corners and every so often on the sides and I pin them straight down into my carpet. This keeps my backing from shifting while I am creating what is called the "quilt sandwich" (which is just the 3 layers of the quilt- backing, batting, and quilt top pinned together). I will get to the curved safety pins in a minute. 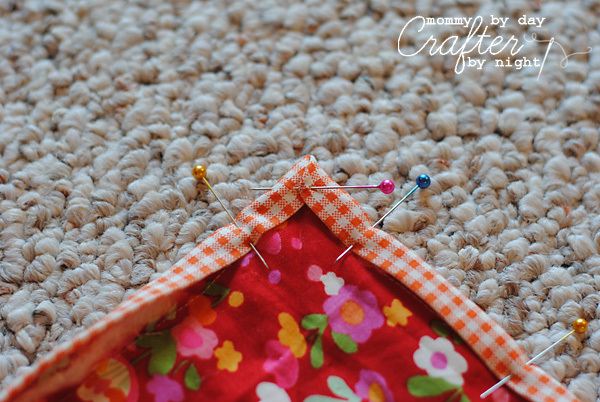 -if you lay your quilt out on a smooth surface such as a wood floor or something, obviously you are not going to have the option of putting a pin straight down into the floor- for this you can just use masking tape and secure your backing to the floor with the tape for these next steps. 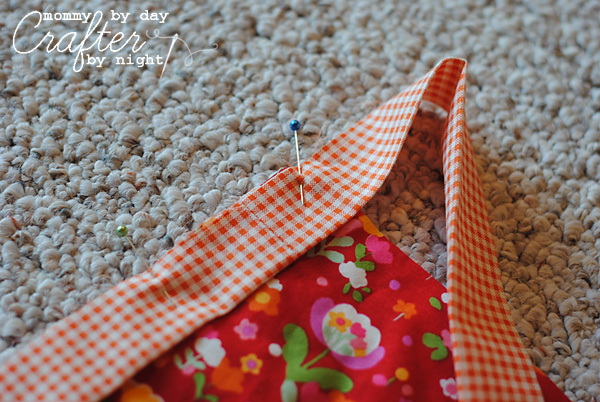 Step 2: So pin your quilt backing down. Once it is secure, roll out your quilt batting. 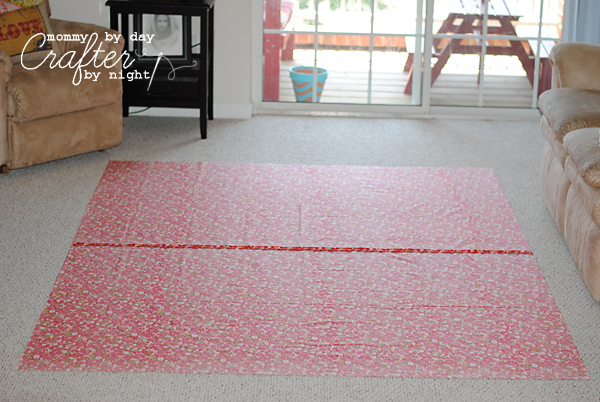 (I used a pre packaged twin size since I had it on hand but you can buy batting by the yard) Your batting may be larger than the quilt backing- if it is, no worries, you can trim it down in a minute. Step 3: Once your batting is all smoothed out so there are no wrinkles, lay your quilt top down and smooth it flat. 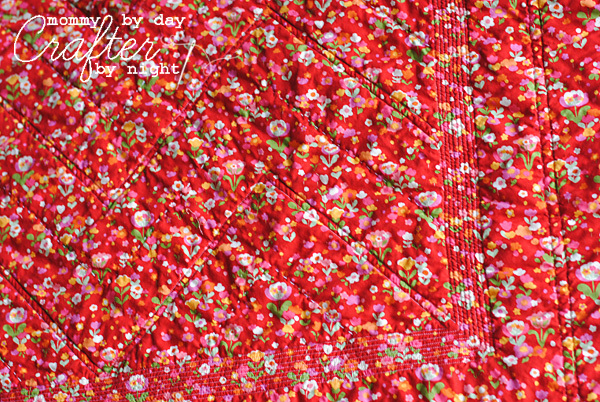 (p.s.- you may or may not need to iron your quilt top before laying it out depending on if there are wrinkles in it.) 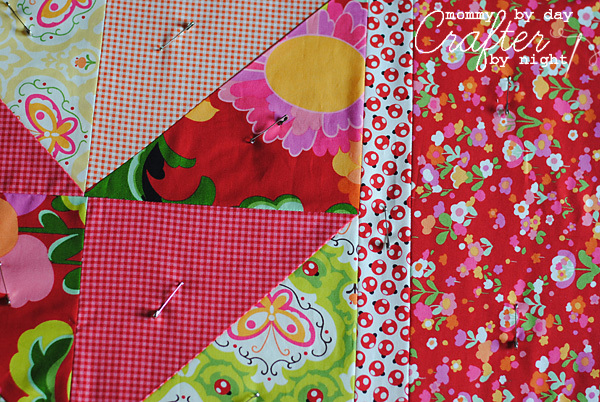 Once your quilt top is laid out, you may trim off any excess batting there is. Just be sure to leave an inch or two (or more if you would like) all the way around the quilt top in case of shifting during the quilting process. Once I have my 3 layers laid out, I usually remove the t-pins carefully from the bottom layer and put it in the same place, but through all 3 layers this time to secure them while I pin for this next step. 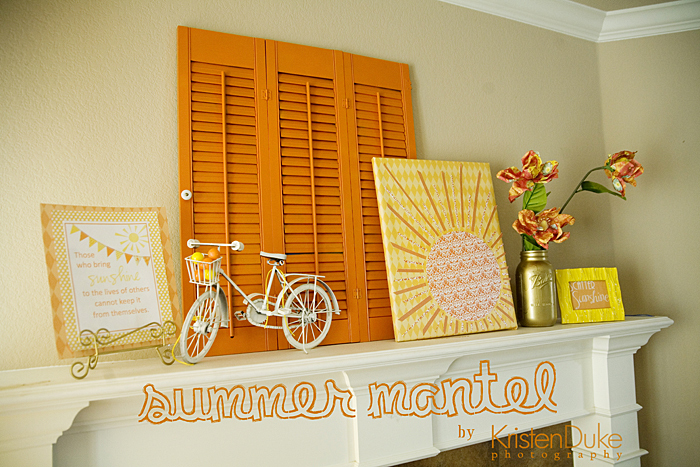 Again- if you are on a hard surface you can use tape. Step 4: This is the step where the curved safety pins come into play.... Now that your quilt is all laid out totally flat, you need to pin every few inches to keep the layers together while you are quilting the quilt. I just put a pin in the middle of each triangle and then every few inches on the borders spaced out evenly to hold the layer in place good. 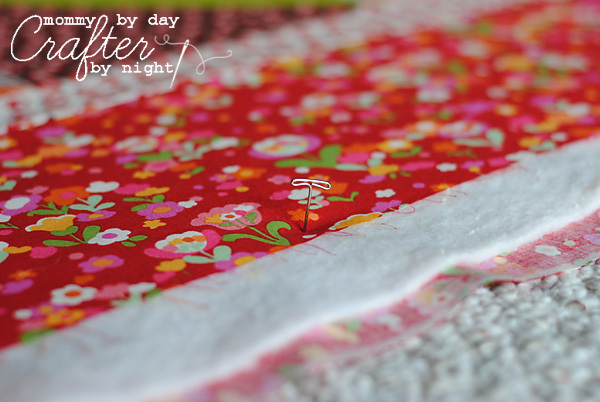 Be sure not to skimp on the pinning... You will be hating life if your quilt isn't properly pinned once you start to quilting it. 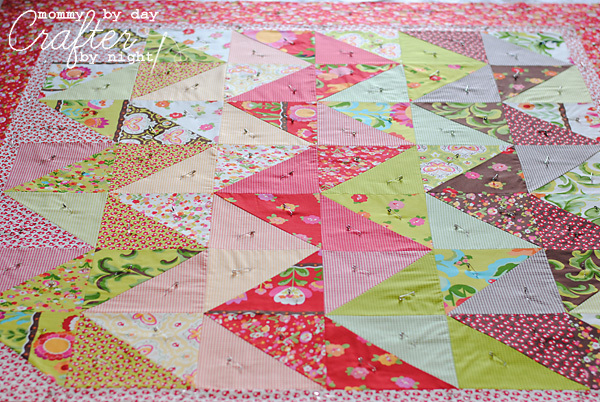 Once you are all pinned, remove the t-pins or tape from the floor and you are ready to start quilting. As you are quilting, you just remove the pins as you go. 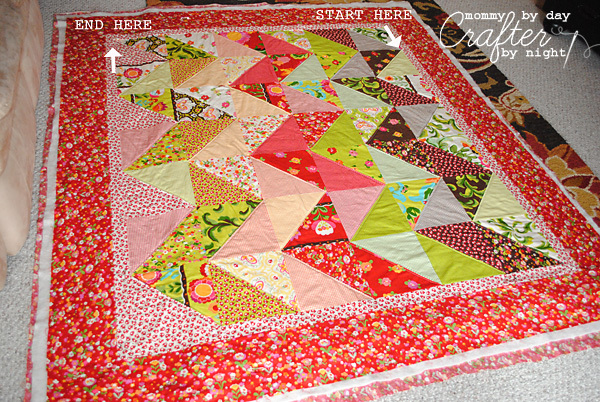 Like I mentioned... there are so many options for quilting this quilt. 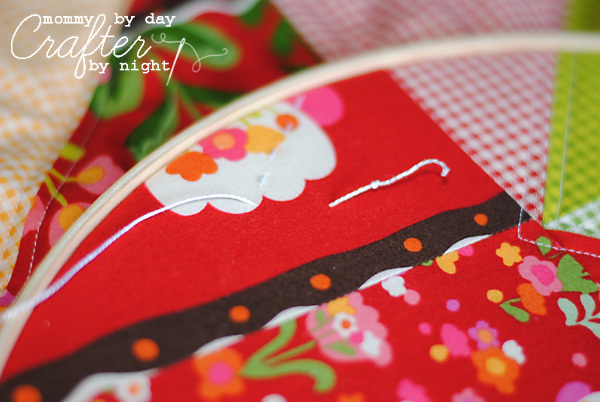 You can use straight line quilting with just your regular presser foot. 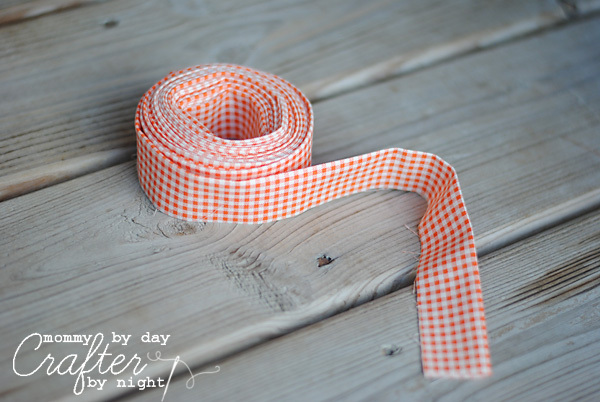 You can use a walking foot to quilt straight lines. 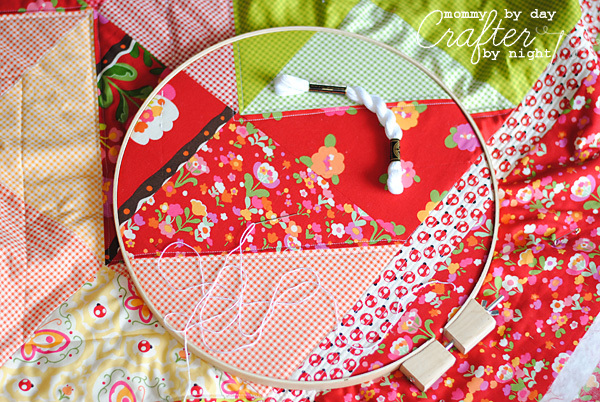 You can use a free motion quilting foot to do any curvy lines you would like. The options are endless. 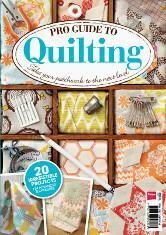 Here is a great resource for anyone that wants to try out Free Motion Quilting. 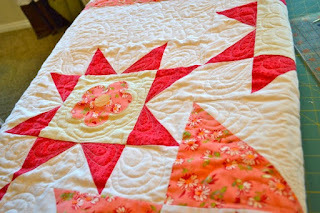 For my quilt I used a combination of straight line quilting with my machine (just my regular presser foot) and I added some hand quilting to give it that extra special touch... I will show you how I did mine. Step 5: Quilting the zig zags. Now- let me warn you. 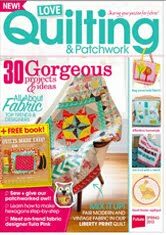 According to quilting guidelines that I have read- you should always start by quilting your quilt in the middle so that you don't have any puckers or any bunching of fabric... But since I went from once side and worked across the quilt I didn't have a problem with it. 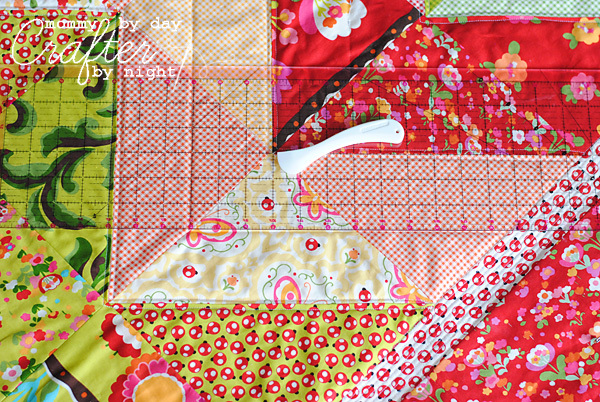 Just as long as your quilt is pinned really well and you try to make sure everything is smoothed out as you are quilting you should be fine. But really- just do whatever feels good for you. I hope this makes sense. 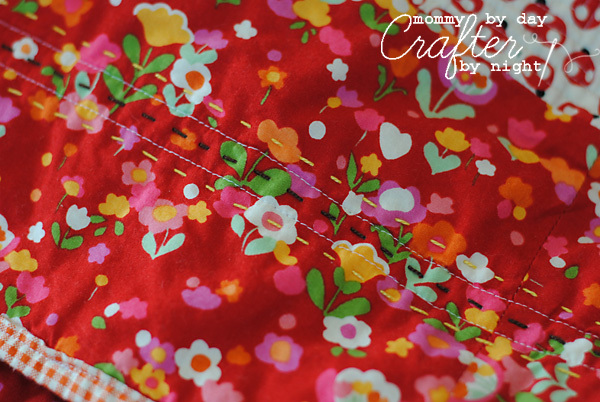 Here is a picture close up that shows how I sewed along the seams. A good way to handle the bulk of the quilt while you are working on quilting an area, is to roll it up to where you are working so you don't have to try to feed a big wad through the neck of your machine. Here is the line marked with the hera marker. 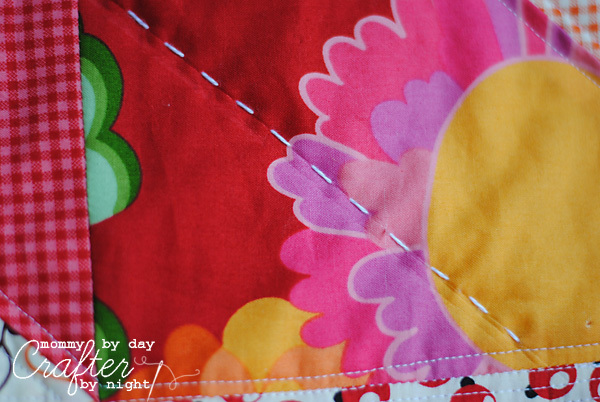 Once I had my line marked, I sewed two lines all the way around the quilt. So that is all of the quilting that I did with my machine...For the remainder of the quilt, I hand quilted it. You take your straight edge and line it up where you want your line to be and then you use the edge of the hera marker and run it firmly along the edge of the straight edge and it creates a line for you. So I used my hera marker and I created a line in the middle of each zig zagged row so that I could use it as a guide for my hand quilting. For my hand quilting, I used a large embroidery hoop, a quilting needle (they are called quilters betweens- they are short and sturdy), and then I used size 5 DMC pearl cotton floss. 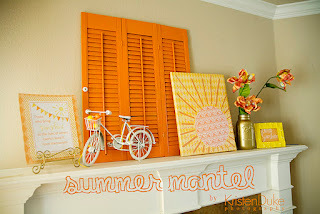 I love Ana Maria Horner's blog... She is so great at hand quilting! Here is an awesome post that answers a lot of questions about hand quilting if you are new to it... She also has an awesome tutorial on hand quilting as well- which is where I learned how to do it. 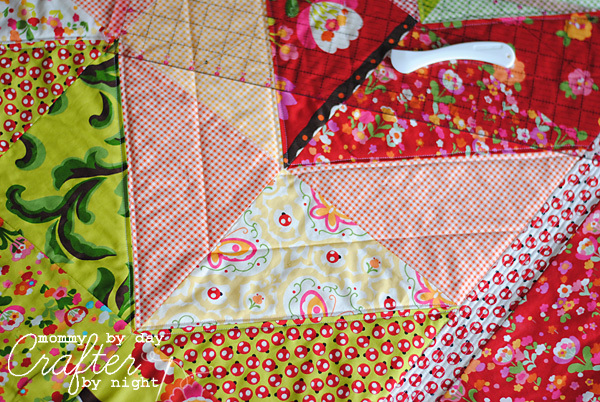 If you have never hand quilted before- definitely refer to her tutorial because mine is just going to be pretty basic. Ok.. So to start, you need to tie a knot in your thread. I learned a really easy way to do a knot and I am loving it. Here is the tutorial... Just keep in mind that the tutorial is using regular thread so you won't need to wrap the thread around your needle so many times if you use the size 5 floss like I did since it is so thick. 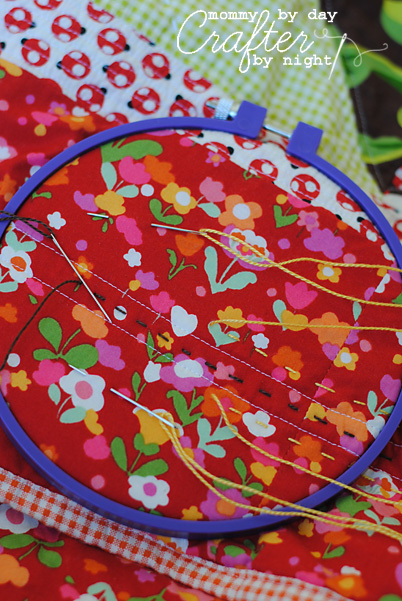 Once your knot is tied, insert your needle into the top two layers of your quilt (but not all the way through to the backing of the quilt) about a 1/2-1 inch away from where you want the stitch to start. Poke your needle up to the beginning point of the stitch and the pull your thread until the knot pops through the fabric and embeds itself in the batting. Then you are good to do your stitching... Again- if this seems vague- refer to the tutorial that I learned from and it is a lot more in depth. I did this for each of the zig zag rows. Now for the hand quilting I did around the border, I did a brown stitch in between the two rows I had sewn with my machine and then did a yellow stitch on each side of the rows sewn with my machine. I just did the 3 threads at the same time so I only went around the quilt once instead of going around 3 different times with the different rows. This is how it looked when it was all done. Here is how the back of the quilt looked when I was all done with my quilting. (I took this before I had hand stitched the 3 rows in the border) I love how the back turned out!! So fun! So hopefully the way I quilted my quilt gives you an idea or two on how you would like to quilt yours. The options are endless! I can't wait to see what you all do! 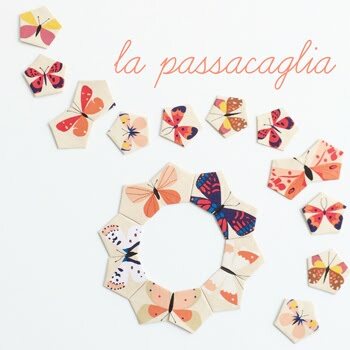 Be sure to leave comments with any ideas you may have to inspire others quilting along with us! 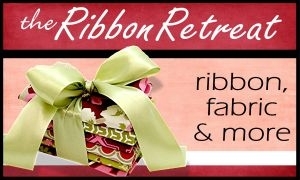 And as always, a HUGE thank you to our sponsor The Ribbon Retreat!